The Water Key encourages you to consider using only the highest quality water filtration and water purification systems on the market. Sawyer® definitely meets our approval. 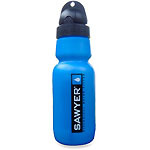 These polycarbonate, flip-top water bottles have an advanced fast-flow inline filter so you can do more yet pack less. Our Filtering Bottle exceeds EPA standards to remove 99.9999% of all bacteria and cysts like giardia and cryptosporidium for 2,000 fill-ups. Our Purifying Bottle removes 99.9997% of all viruses as well, lasts for 12,000 fillups, and includes an adapter for use with a tap. Just fill and sip normally. It’s that simple and that safe. 32 oz. capacity with filter. USA/China.